Submit a dental hygiene program application with supporting documents by February 1 for best consideration. Applications received after this date may be considered only after applications received by the deadline have been reviewed and processed. Be able to complete all prerequisite courses by the start of fall semester. Preference will be given to students who have completed all course work by the end of spring semester. No more than three courses will be considered for grade replacement. Please note: applicants may only repeat two science courses. Thank you for your interest in Indiana University South Bend. We're happy for this opportunity to introduce you to the Dental Hygiene Program. We are proud of the professional reputation of our students and graduates. We strive for excellence in the clinic, and classroom. We are a learner-centered program providing various educational experiences including hands-on, activity based, and gaming. 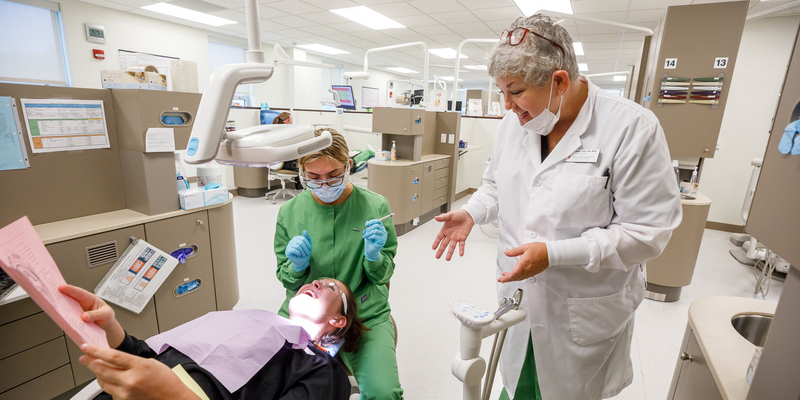 The Dental Hygiene curriculum, which is accredited by the Commission on Dental Accreditation of the American Dental Association, leads to the Bachelor of Science in Dental Hygiene (BSDH). Please click the expanders below to learn more about the application process. If you have questions about the application process, or the dental hygiene program please email the Program Director Mallory Edmondson MSDH, RDH at mledmond@iusb.edu. A balance of science GPA (35% of application score), application GPA (40% of application score), essay (10% of application score), completion of General Education Requirements (10%), and course repeat (5% of application score). A minimum of 2.0 is required for each GPA (application and science). Personal Essay strength. Each applicant will be required to answer with a 300-word, typed essay response to the question: “What does becoming a dental hygienist mean to me?” (10% of application score). Completion of each prerequisite course and general education requirements with a grade of C or better (2.0 GPA). 2. Alternate Acceptance: applicants who have met all program criteria and policies, but have not completed all requirements for full acceptance. 3. Non-acceptance: Applicants who cannot complete required course work by the start of fall semester or who do not meet minimum academic requirements. Applicants who meet the February 1 application deadline will be notified via U.S. mail their provisional admissions status by April 1st via the address provided on the application. To hold a place in this class, applicants must return the confirmation form and requested documentation by the due date, which will be outlined in the provisional admissions materials. Intercampus Transfer requests are to be made after acceptance in the program has been confirmed. It is not necessary to make this request prior to acceptance into the program. Alternates will be admitted after June 1 until the class is filled. Students who have been accepted into the program and are completing prerequisite course work must provide an official transcript of the final course grades to the Office of Admissions as soon as they become available. Indiana University students can submit a copy of their transcript from One.iu. Non-Indiana University students must send an official transcript. It is the student’s responsibility to submit all official college transcripts to the Office of Admissions AND unofficial transcripts to the Dental Hygiene Program as requested. Students must complete all required prerequisite course work before they are eligible to enroll in Dental Hygiene classes. Please contact the Dental Education office at 574-520-4158 for information on registration. Students who have not been accepted can reapply after November 1 for the following academic year. To reapply, students must submit a new application. Student application files are kept for one year.